Just Some Stuff I Made | Look out! It's where I let my crafty ramblings loose. Look out! It's where I let my crafty ramblings loose. 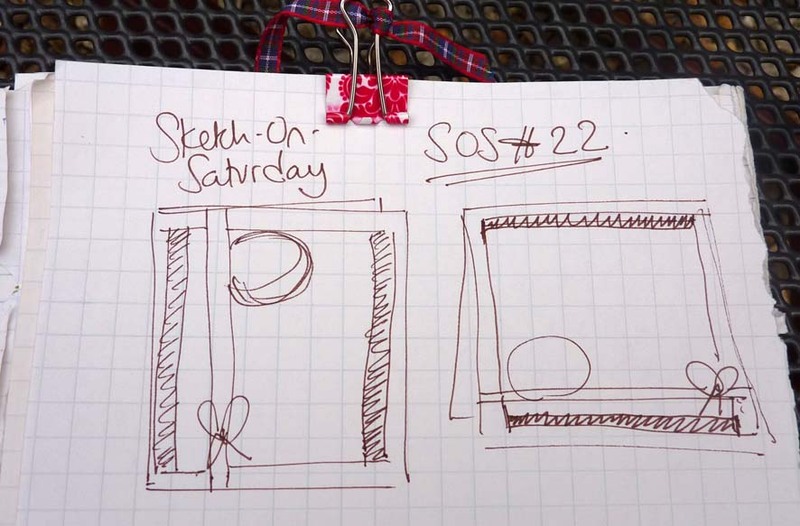 Something exciting to share that I have been working on behind the scenes – after all, sleep is over-rated no?…. Justsomestuffimade is on the move! Don’t forget to bookmark me there, or better still update your email feed/ RSS feed, so you can have my posts delivered straight to you! So would you Adam-and-Eve it, I’m back. Over in the new ‘crafty zone’ there anyway. You see, I haven’t completely dropped off the planet or deserted the bloggo after all! I know that my crafting mojo seems to have pretty much vanished lately with not so many cards and ideas to share lately. And not much opportunity for getting around all your lovely blogs either. Anxious times at work. But that’s another story for another day. Will share when I feel more like explaining! And besides, bring a yummy new blog design to life has taken a bit of time and organising too, don’t you know?! you there from now on!!! Hi all. 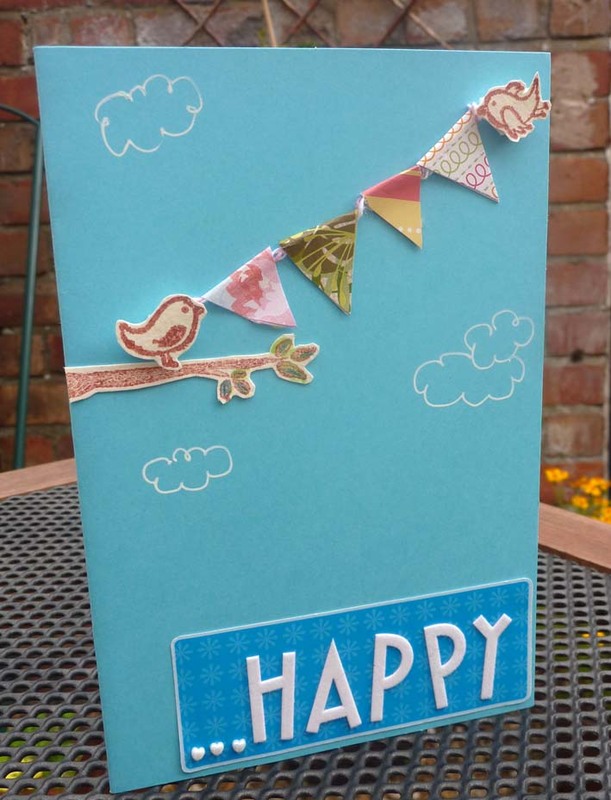 Today I have a card that I made to help use up a pile of scraps from my recent purge. 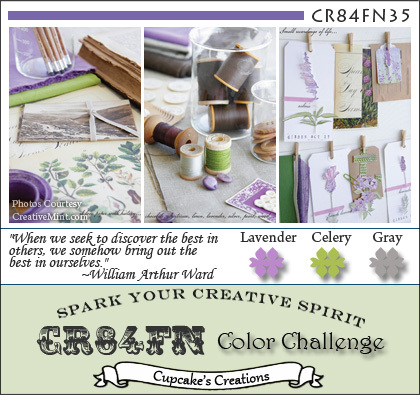 And I made it to enter in the challenge over at the Some Odd Girl blog – Use 2 complementary colours. The background is made of 5 patterned paper scraps – I just dug out a bunch that would fit my colour scheme and arranged them in stripes. Amongst others there’s some Making Memories and My Mind’s Eye. 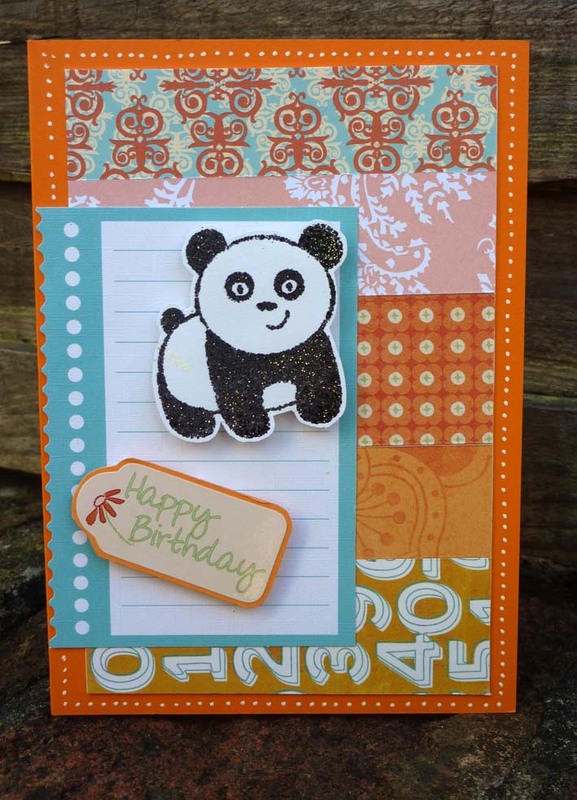 Can’t remember where the die-cut journaling shape came from (sorry) but it makes a good layering panel for my super-cute panda friend, no? He is a Snag ’ems clear stamp by Imaginisce, heat embossed using WOW embossing *glitter* ‘Black Twinkle’. 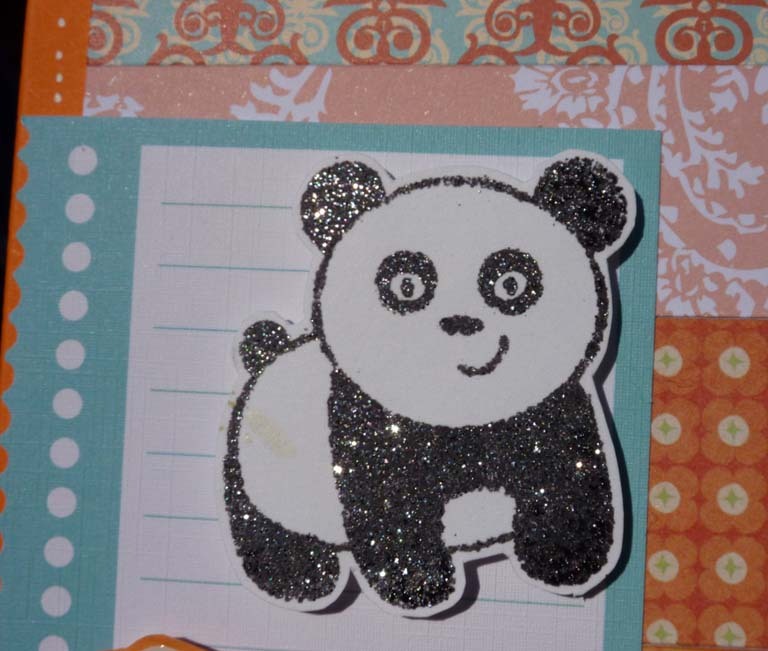 Yes folks, embossing GLITTER! Embossing *and* sparkle. Have a good day everyone, and hope you fit in some crafty time! I have been feeling very mojo-less and really lacking in energy for being creative. Hard to believe, huh? Well, c’est la vie. Life has been taking over in a big way, and offering its distractions. But enough of that. A sketch came to the rescue for today – I was playing around this morning with a few ideas in my notebook, and wasn’t happy with any of them until I combined elements from a couple of options… Yay – that’s better! It’s been a while since I got inky with my Papertrey Ink goodies (horror!) so I went for ‘Background Basics – Newsprint’ stamped in grey on a vellum piece that I found in my stash whilst flicking through some long-forgotten papers. A “new” discovery! More kraft with the Jillibean Soup journaling sprout spot for the sentiment, with a bit of a journalism-themed pun. This card is for a journalist friend, so I hope he will like it. And a fancy square metal brad. 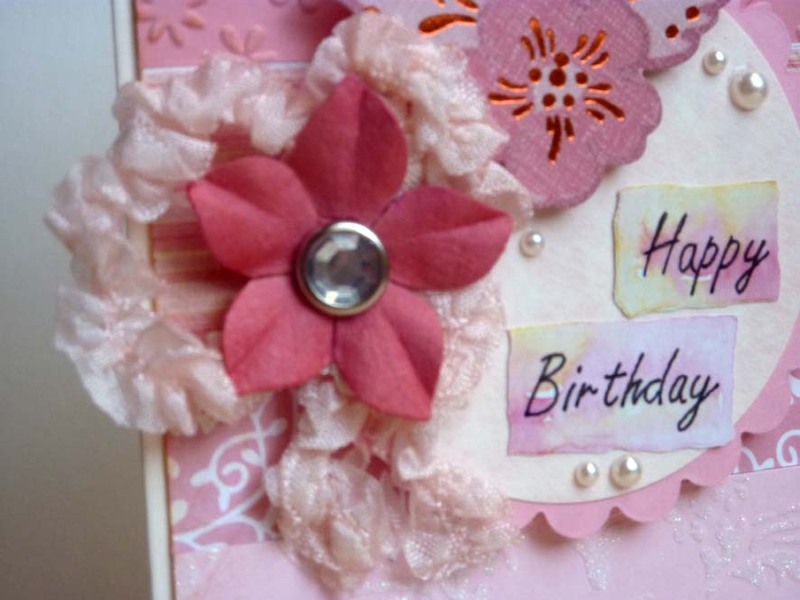 I’m entering this card into the latest challenge over at A Passion for Papertrey: One for the Boys. The newsprint stamps turned out to be perfect for my card. tried to post it and now it has worked, but without any pics. can’t get them to work. back soon when I manage to sort out the weirdness gremlins. – Stamps and Stickers: anything that grows from a seed, gardening, back to school, worms! But the yellows, greens and touch of brown are there! No stamps or stickers, no marker pens but I went for it with the gingham background paper and inked the edges with Distress Ink ‘Tea Dye’. And the buttons are threaded with twine – so that’s good for the embellishments ingredient and the technique. 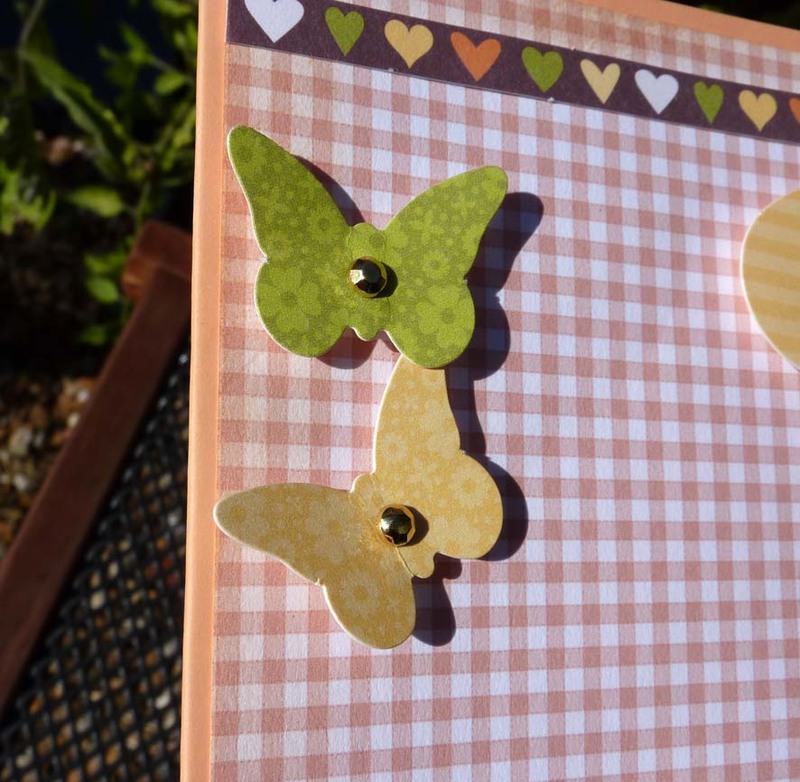 I used a few die-cut pieces from a Jillibean Soup ‘Dutch Mustard Soup – Pea pod parts’ sheet – the butterflies (kind of gardeny for the theme huh?) and the speech bubble message and the hearts border strip. 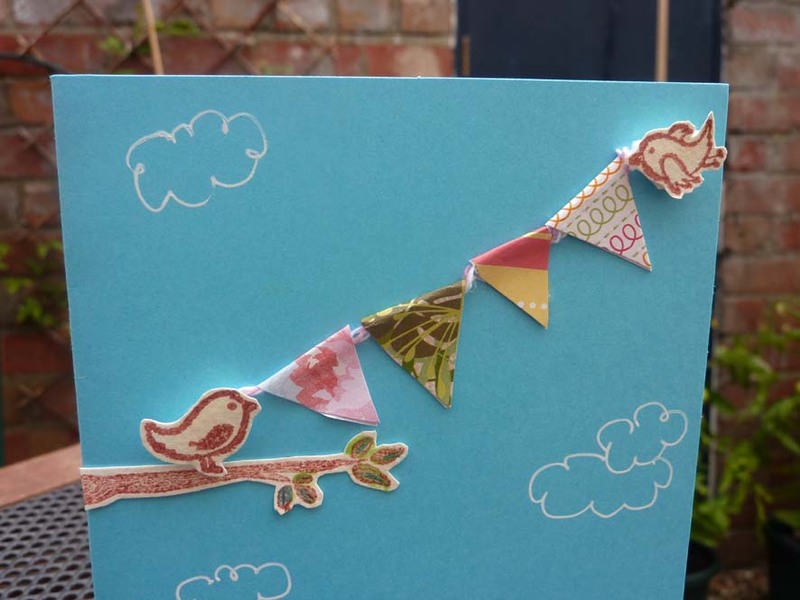 Here’s an idea I had for a card on the on-trend bunting or banner theme… this time a masculine idea. 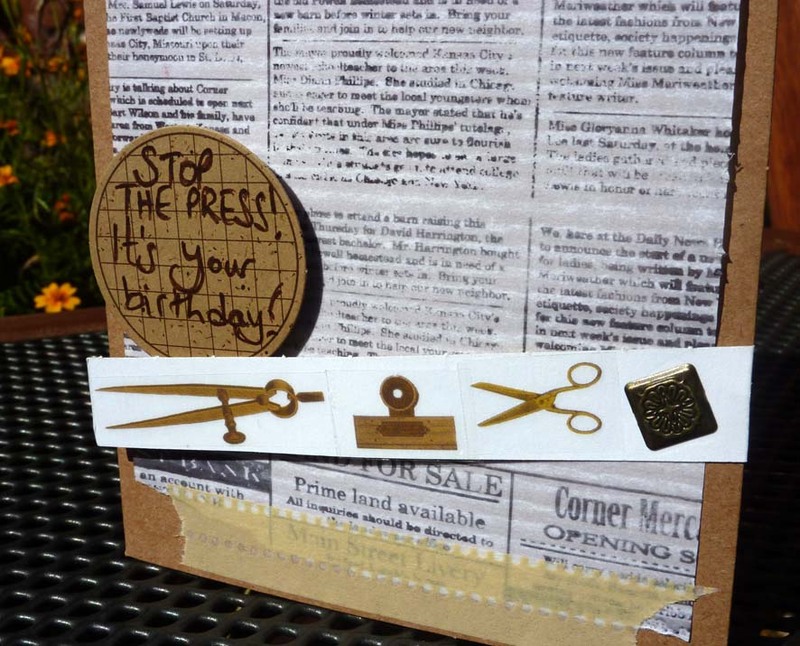 I need a card for the birthday of a dear friend’s hubby next week and thought it would be a good chance to get this ready for him. 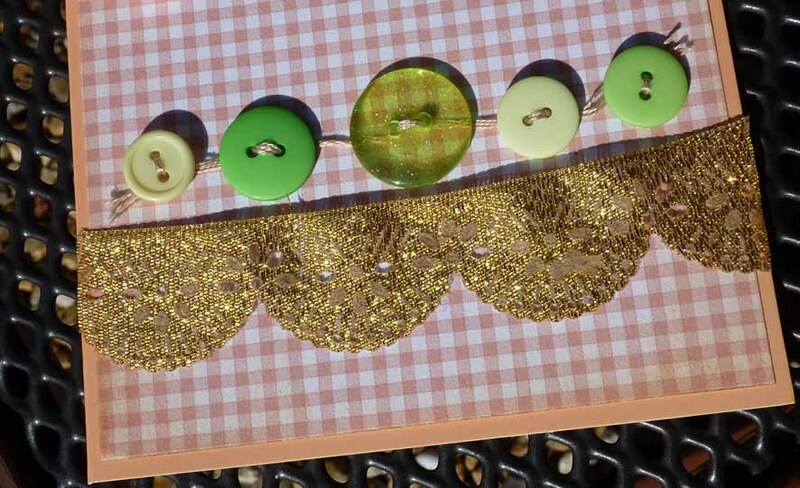 CAS design… Keep the embellishments to a minimum… Stick to bold or monochrome colours…. Steer clear of flowers, bling and ribbons…. 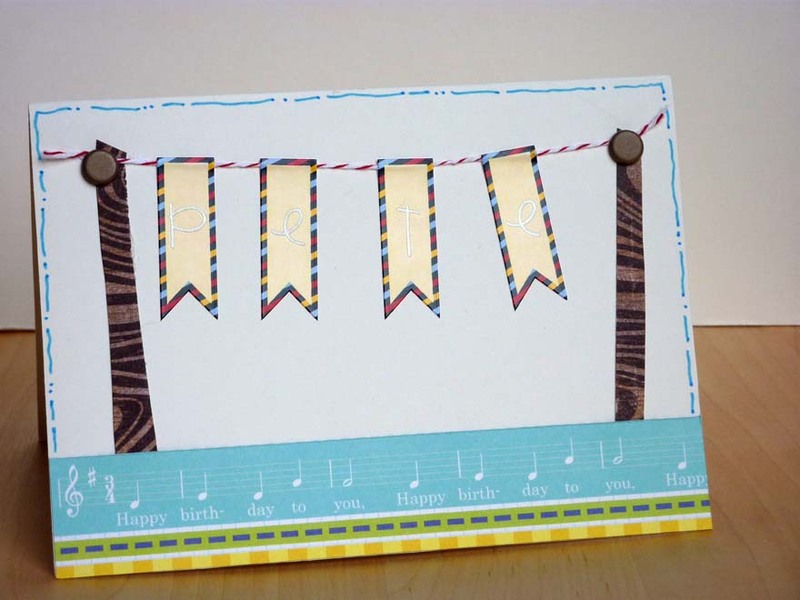 The strip of birthday paper across the bottom is trimmed from Jillibean Soup ‘Spotted Owl Soup – 3 Dancing Hats’. Here I am folks, yes I think you may be forgiven for thinking that I had fallen off the planet. Many apologies for that. “If you think you might fit in some creative time and some such opportunities to feed the soul Ruth, then you’re really mistaken! !” is what is felt like round here. But I managed to squeeze in a bit of crafting yesterday. Relief! Papercraft inspirations magazine a couple of months ago. Explains itself otherwise, I think. I shall be attempting a normal blogging service this week. Fingers crossed folks, for all our sakes. 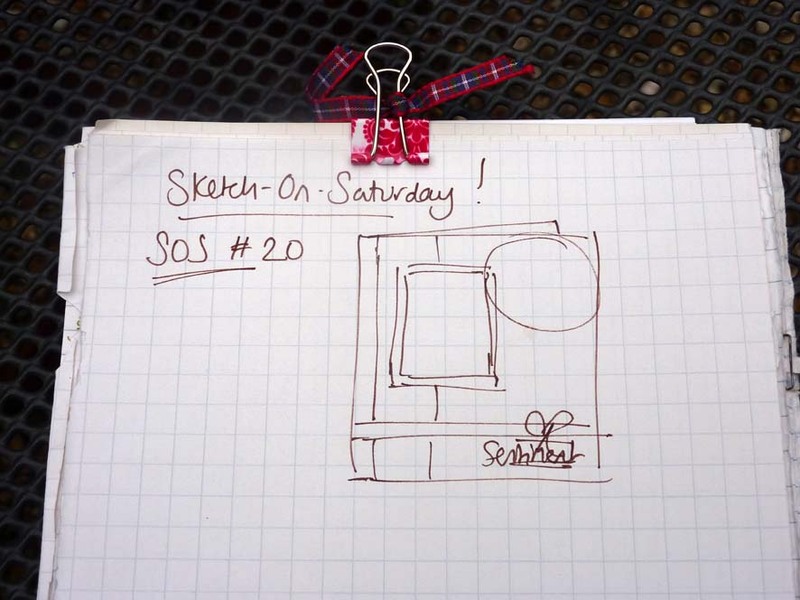 So I was feeling pretty directionless this morning – so many things to do, where to start? It was all feeling like a bit of a fog (and the weather has been equally damp and miserable!!). Finally a bit of time to squeeze in a card idea before dinner. My brain was feeling pretty drained, but a bit of inspiration from The Shabby Tea Room #73 ‘Mix & Match’ challenge set things right. 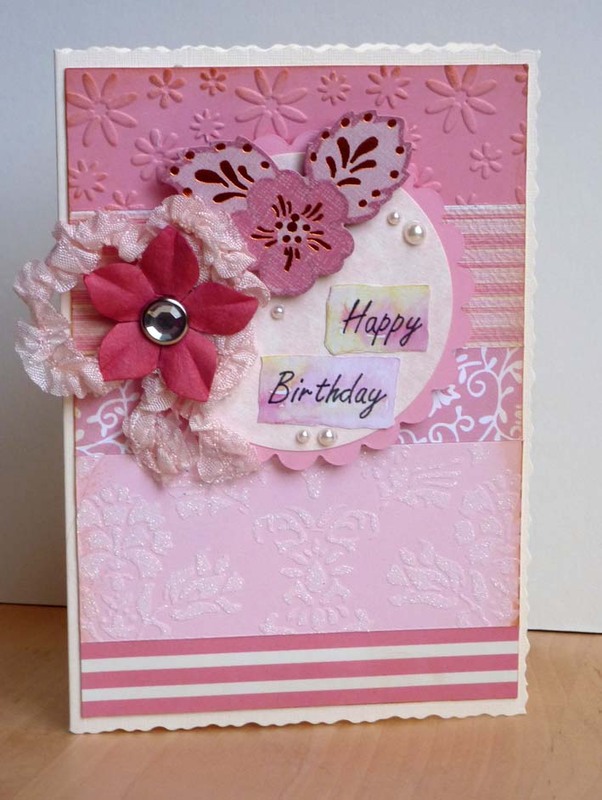 I used up a few bands of patterned and embossed paper scraps (yay!) and did a spot of Distress Inking in ‘tea dye’ to help shabby things up. 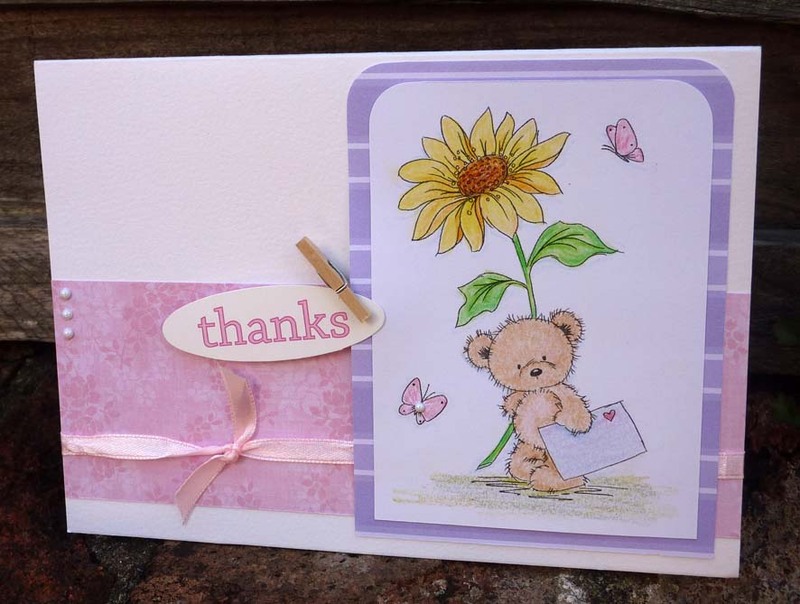 The top flower is a die-cut piece by K&Company ‘Handmade’ collection, with coppery metallic accents (yum!) 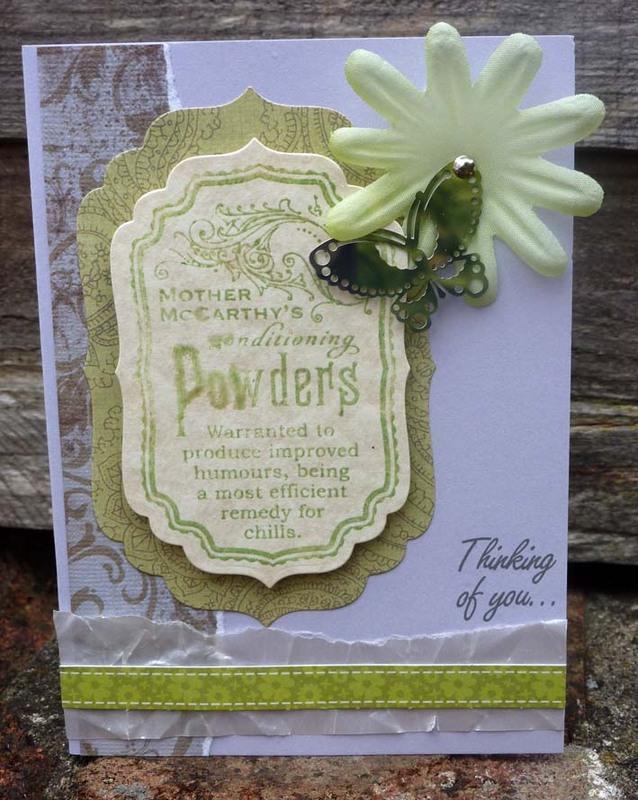 and the Prima flower is layered with a ruffly trim bow (which I think might be by May Arts?). It’s very reminiscent of the ruffles on the cushions in the inspiration photo and I also added a jewel brad inspired by the lovely display of mirrors there. Have a good rest-of-weekend, though there’s not much left! So crafting time has been a little thin on the ground this week – sad, but true. fruit picking (yummy apples and plums – all on an impulsive whim, after zumba night. I was walking home with a pal and we decided to go for it and fill our bags before the goodness all gets snaffled by some other fruit-picking passers-by!)…. But back to the crafting schedule, that is what you stopped by for, right? A new sketch for today! The scraps of patterned paper are by DCWV and My Mind’s Eye, and the border strip at the bottom is some scrunched vellum layered with a Jiilibean Soap border. Will need to experiment with this a bit more methinks. It’s die-cut with coordinating Nesties ‘Labels 4’. The grey touch in the colour inspiration is a nice neutral and with the soft pearlescent vellum, grey-toned paper band and silver butterfly embellishment I think it works. So it just a quickie from me this morning – I am running late and don’t want to miss the train!! What’s not to love? All summery and fun! 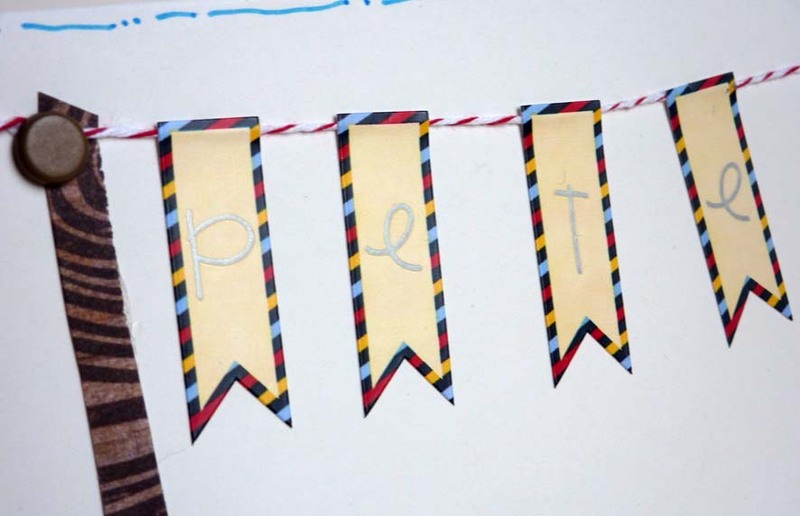 The cute bunting is made from scraps – folded over a bit of twine. Clouds are doodled in white gel pen, and the message is layered up patterned paper (more scrap usage!!) 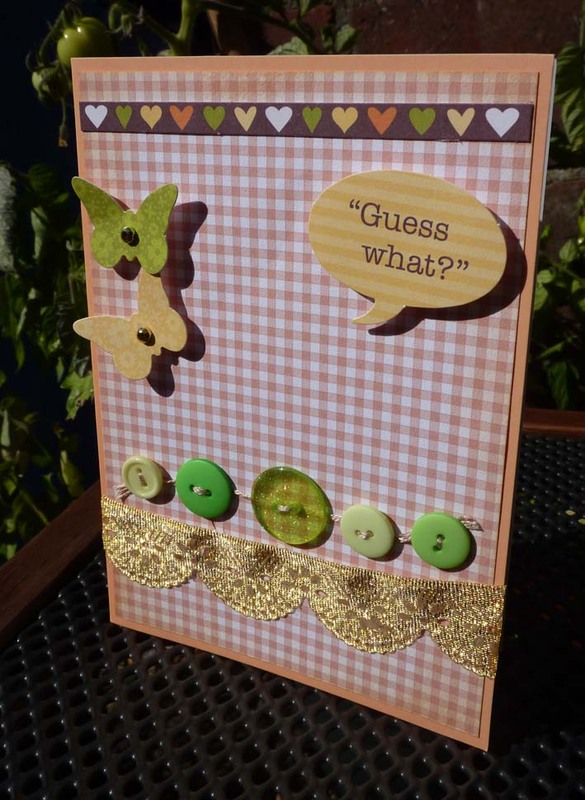 with flock stickers (Doodlebug Design) and some mini gems. Got to be honest… I’m not altogether pleased with this card. The idea and design are good, but I was in a hurry last night to get it done before bed and it was late and I was tired. All of which = a not very good level of finish for my card. 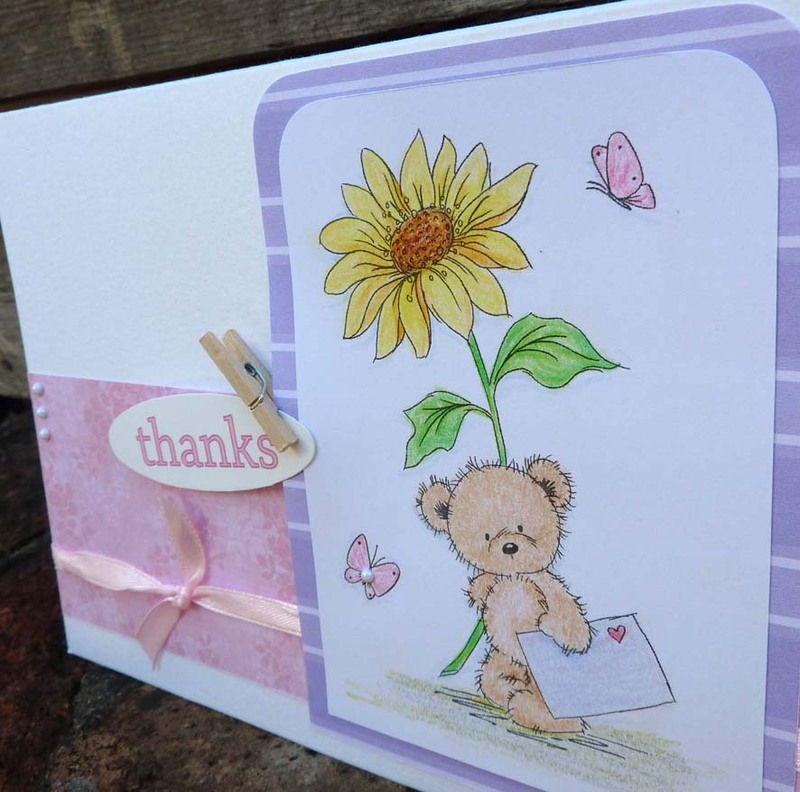 I think it shows, so I am not going to send this card. It will be heading for the ‘recycle me’ pile. Ah well, you can’t win them all. 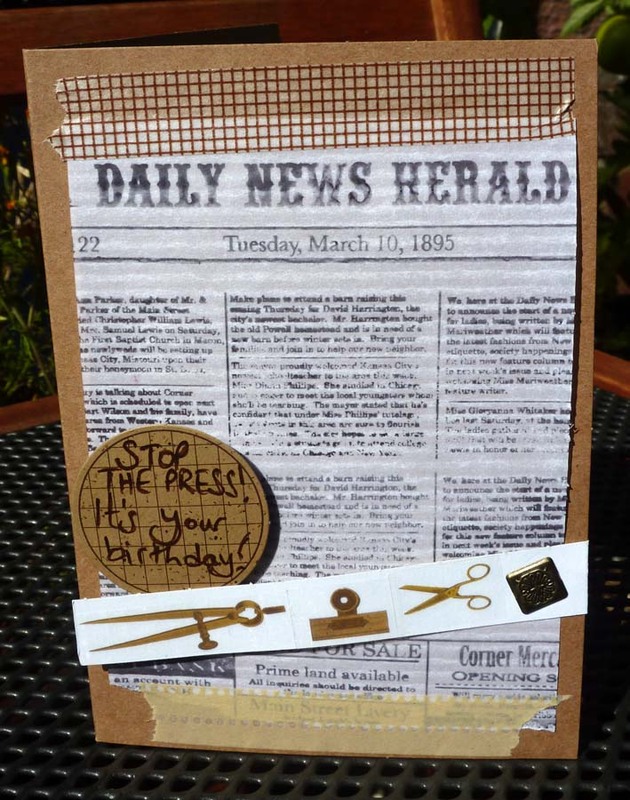 PaperCraft inspirations magazine – with free stuff!